STOP HS2 | How much more land? More land will be taken for HS2 – but it is not clear yet when, exactly where, or how much will be involved. Cheryl Gillan wrote to Robert Goodwill MP, junior minister of transport, asking for details of all the proposed additional land requirements for HS2 and the timescale. Robert Goodwill replied to say that, although there should be an update in February 2015, future additional provision won’t be released until after the General Election. 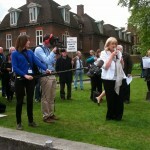 “This is yet another example of how HS2 plans are up in the air and unclear,” said Cheryl Gillan.